Hadoop and its ecosystem apps like Hortonworks, Cloudera, Kafka, Spark, Hbase, Tensorflow, Druid and others are popular tools used in modern data analytics, AI and ML projects. However, deploying these apps typically starts with weeks of careful infrastructure planning to ensure good performance, ability to scale to meet anticipated growth and continued fault tolerance, as well as high availability of services. Post deployment, the rigidity of the infrastructure poses operational challenges in adjusting resources to meet changing needs, patching, upgrades, and performance tuning of the analytics apps. 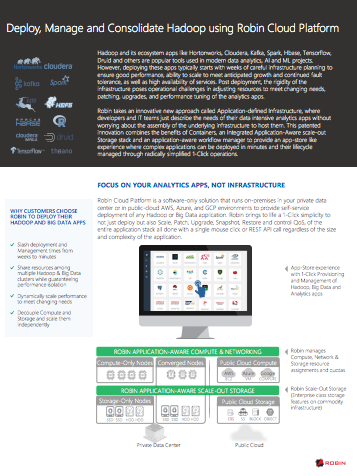 ROBIN hyper-converged Kubernetes platform takes an innovative new approach where application lifecycle workflows are natively embedded into a tightly converged storage, network, and Kubernetes stack; enabling 1-click self-service experience for both deployment and lifecycle management of Big data, Database and AI/ML applications. Enterprises using Robin will gain simpler and faster roll-out of critical IT and LoB initiatives, such as containerization, cloud-migration, cost-consolidation and developer productivity. Download this free Hyper-Converged Kubernetes Hadoop white paper to learn how you can save at least 40-60% on resource consolidation and lifecycle management of Hadoop and it's services.